Polar Berry | Gurney's Seed & Nursery Co.
A breakthrough in blackberry production, this wonderful WHITE berry is the only one of its kind! White blooms cover the plant in late spring to early summer, making way for the creamy white, sweet fruit that grows on second-year canes. Unlike its traditional cousins, Polar Berry™ features green foliage and canes—a completely different look for blackberry plants—due to the lack of red coloring in the plant. Berries are larger than the standard wild blackberry, but are just as sweet and juicy. An excellent variety for jams, jellies and preserves, as well as juicing or freezing for later use. Ripe fruit can be frozen for 6-8 months. Exhibits good disease resistance and is self pollinating. Plant in full sun. Grows 4-6' tall with an equal spread. Zones 5-9. SpacingSpace 4 - 6 feet apart in the row. Leave 8 - 10 feet between rows. FoliageLight green leaves mature to a bright green. Leaves and canes lack the hint of red usually present in blackberries. This is due to a lack of anthocyanin. FruitCreamy white, sweet berries that are larger than a standard wild blackberry. PruningWhen the new shoots of erect blackberries reach 30-36 inches in height, cut off the tips. This will force branching lower on the canes and will cause the canes to thicken, making them better able to support a heavy fruit crop. During the winter, prune the laterals to 12-14 inches for convenient harvesting and larger berries. In late winter, remove any remaining dead or weak wood. Leave healthy, vigorous canes spaced at six canes per linear foot. CommentsA White Blackberry! This unique blackberry was discovered on a farm in South Central Illinois, growing among some wild blackberries. 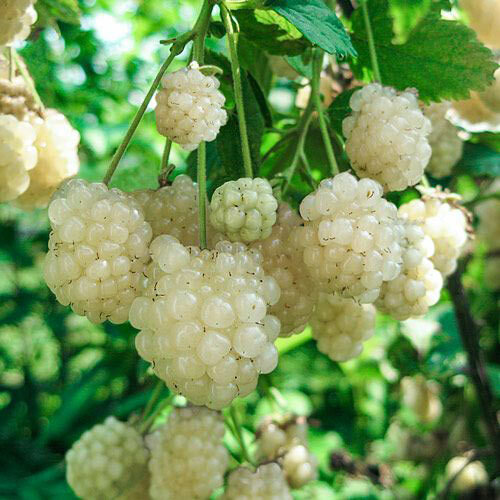 Creamy white, sweet berries are produced on second-year canes. White flowers decorate the plant from May to June. 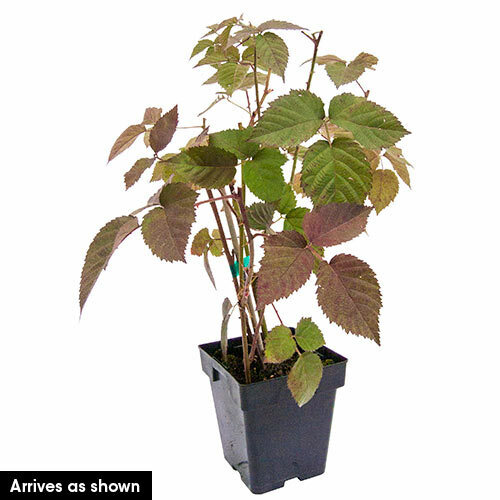 Leaves and canes are green, without the red coloring that usually runs through other blackberry plants. This is due to the lack of anthocyanin. Enjoy this sweet wonder as a fresh snack, in jams, jellies, juice, or freeze to enjoy later. DepthDig a hole twice the size of the pot the plant is in. Plant at the same depth as it was in the pot.